What is the difference between MSAA Special Events and a Create Your Own Fundraiser? A MSAA special event is an event that MSAA organizes, such as Swim for MS and our Improving Lives Benefit. A ‘Create Your Own Fundraiser’ is an event that benefits MSAA that is organized by a volunteer. MSAA is not involved in organizing a ‘Create Your Own Fundraiser’ but will assist with ideas or questions. Once I sign-up, do I automatically start organizing my event? Submitting a volunteer interest form notifies MSAA that you are interested in organizing an event. MSAA will follow-up with you within 2 business days to review the details of your event. However, you may begin organizing your event as soon as you are ready! For MSAA's assistance with promoting your event, you may wish to contact us at (800) 532-7667, extension 161 or email events@mymsaa.org. You can also refer to our MSAA 3rd Party Event Marketing Guidelines. Volunteer positions are open to all individuals regardless of race, color, religion, sexual orientation, gender, national origin, age, veteran status, or condition of disability. MSAA does not have an age requirement for most of our volunteer opportunities. Please contact us for additional information. MSAA accepts all volunteers, including those who wish to complete required community service hours for school, clubs/organizations, and personal enrichment. MSAA does not accept volunteers who have been court-ordered, without permission from the respective parole officer and/or judge. All court-ordered volunteers are responsible for directing their officer to contact Angel Serrano, Senior Manager of of Development at (800) 532-7667, ext. 117, to ensure our volunteer opportunities are acceptable to fulfill your court-ordered requirements. Submit your best work! Each year, MSAA’s Annual Art Showcases celebrates the work of artists affected by MS. Submissions for both Art Showcases will be accepted between October and December each year. Submissions can depict people, places, or things. Please do not submit inappropriate artwork it will not be included on our website. Submissions must clearly depict a specific season (spring, summer, fall, winter) or holiday (Easter, Hanukkah Thanksgiving, Mother's Day, etc.). To enter, you must have a diagnosis of multiple sclerosis and provide a copy of a doctor's verification of your diagnosis. 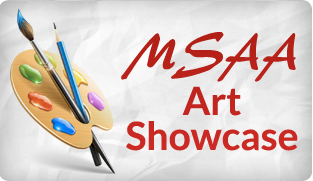 MSAA Art Showcase, Attn: Angel Serrano, 375 Kings Highway North, Cherry Hill, NJ 08034 before the deadline. Complete the online registration form, release form, and review the contest rules before submitting your work. Attach a letter from your doctor confirming your MS diagnosis. Please include your name, city and state, and a short (150 words or less) biographical statement that speaks to your interest in art and includes how MS affects or has affected your interest or work methods. Attach an electronic copy of up to three (3) pieces of your artwork (you may submit up to 3 for each showcase) to your email. 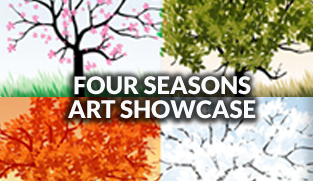 For each artwork submitted, please include the medium, which showcase you are submitting to ("Ability" or "Four Seasons") and entry title. The image(s) should be in color and should be formatted to print out on an 8-1/2" x 11" page.